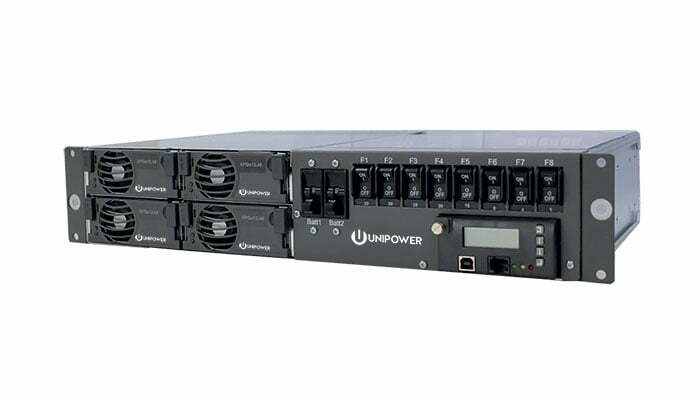 Aspiro 2U 60 Amp Front Access DC Power System is a 2RU high 19” rack-mounted, integrated solution providing an output of -48VDC. The system can accommodate up to 4 Aspiro family high efficiency hot-swap rectifiers. Aspiro 2U 60 Amp Front Access DC Power System provides a total load current of 60A / 3.2kW with battery charge current up to 30A in addition. The rectifiers are internally fan cooled with speed control which is a function of load and temperature, keeping acoustic noise to a minimum. The systems offers full front access for cable connections with push-pull mounting brackets for either 19” or ETSI mounting. The DC output circuits of the Aspiro 2U 60 Amp Front Access DC Power System can provide up to 8 loads with breakers rated from 1A to 30A. 2 additional breakers provide battery protection. A programmable 125A low voltage battery disconnect (LVBD) is standard while an optional partial load disconnect (PLD), also rated at 125A and programmable, can provide non-critical load shedding when operating on batteries.